Drive to Mandawa is a part of semidesert region of Shekhawati is a colourful fantasy having a fascinating uniquely of its own. The open air art gallery, as it is popularly called is famous for its plethora of painted Havelis, all commendable pieces of the rich artistic traditional of this region. Afternoon sightseeing tour of Bikaner, Bikaner offers several attractions to the tourists besides, of course, the exotic camel safaris. Some of the major attractions around the city are Junagarh Fort, Camel Breeding Farm, Gajner Palace and Ganga Golden Jubilee Museum. Morning visit Deshnoke Karni Mata Temple (Rat Temple). 30km south of the city. The 17th-century temple is not for the squeamish. Devotees believe that rats are reincarnated souls and it is considered auspicious to let the long-tailed hordes that live here scramble over your feet. Afternoon visit Camel Breeding Farm, Rest of the day at leisure. Overnight at Hotel. Morning drive to Jaisalmer (320 kms/06 hrs), Jaisalmer is an important destination of the western state of India, Rajasthan. A desert city, it was founded by the Bhatti Rajput chieftain Rawal Jaisal in the year 1156. Jaisalmer could be regarded as the western sentinel of entire India and a place worth visiting to get an idea of the native Rajasthan. Located at the heart of the great Thar Desert, it offers the visitor an enchanting world of fable, colour, and history. Moreover, the magnificent wood-and stone-carved mansions and buildings display the love and interest Rajputs had for the fine arts. Rest of the day free for leisure. Overnight in Hotel. After breakfast at hotel, drive to Jodhpur on route you can visit Pokaran and explore the town. On arrival check in hotel and enjoy sight seeing tour of Jodhpur. The forts and palaces in the city are the major source of attraction in the city. Exploring the forts gives you a feel of the times when the Rajput might was at its peak. The gates and the walls of the forts speak of the battles they have witnessed. One needs to spend enough time with these historical monuments to fully grasp the grandeur of the Rajput era. Some of the major attractions around Jodhpur are Mehrangarh Fort, Jaswant Thada, Umaid Bhawan & the Government Museum and Zoo. Overnight in Hotel. 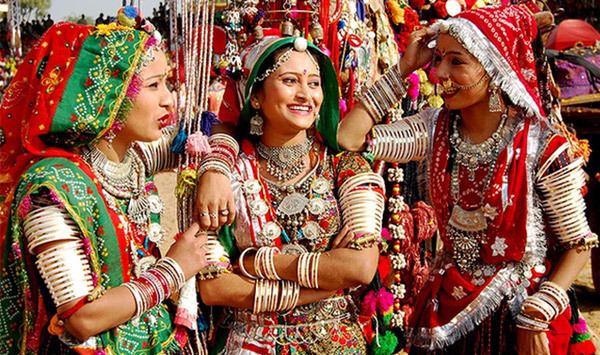 Morning Visit Bishnoi Village near to Jodhpur and enjoy jeep safari and experience the rural Rajasthan by your own. Later drive to Kumbhalgarh and check-in at the hotel Afternoon visit Kumbhalgarh Fort, Cradled in the cluster of thirteen mountain peaks of the Aravalli ranges, the formidable medieval citadel-Kumbhalgarh stands a wary sentinel to the past glory. Rising from a prominent ridge, 1914 meters high from the sea level, the fort was built in 15th century AD by Maharana Kumbha(1419-63 AD). The massive fort,encompassed by a 36 km long wall, has seven majestic gates and seven ramparts, one within the other. Rounded bastions and soaring watch towers strengthen the crenallated walls of the fort making it an impregnable structure. Fascinating chambers are built on the western side of the last gate-the 'Nimboo Pol'. Overnight at Hotel. Drive to Udaipur visiting enroute Ranakpur Jain temples, Temple was built during the reign of the liberal and gifted monarch Rana Kumbha in the 15th century. An enormous basement covers 48,000 sq. feet area. There are four subsidiary shrines, twenty four pillared halls and eligibly domes supported by over four hundred columns. The total number of columns is 1,444 all of which are intricately carved no two being alike. The artistically carved nymphs playing the flute in various dance postures at a height of 45 feet are an engrossing sight. In the assembly hall, there are two big bells weighing 108 kgs. Whose sound echoes in the entire complex? Later continue driving to Udaipur, check in your hotel, rest of the time at your leisure. Overnight at Hotel. Morning at leisure and later enjoy city sightseeing tour. The city is famous for its palaces, lake, museums, temples, and gardens. The City Palace and Museum is considered as the largest palace complex in Rajasthan and its museum has stunning collection of objects collected by different Maharanas of Udaipur over the centuries. The Picholia Lake, Udai Sagar, and Pratap Sagar are some of the most beautiful lakes in the state. Some other attractions in the city are the Jagdish Temple, Saheliyon Ki Bari, & Bhartiya Lok Kala Mandir. Afternoon free for independent activities, Overnight in Hotel. After breakfast at hotel, drive to Kotah by visiting Chittaurgarh on the way. Chittorgarh, the awe-inspiring hill fort built on a massive rock 3 miles long and 495 feet high, lies 72 miles northeast Udaipur. It was said that this fort was the key to all of Rajputana, and any conqueror who had ambitions on Rajputana had to be the finest medieval Hindu fort in existence. But more than that, it is cloaked in legends of valor, chivalry and glorious death and occupies a preeminent position in the Rajput psyche. Chittorgarh was built in the 8th century by Bappa Rawal the first of the great Sisodia rulers. Between then and 1567 it fell victim to three bloody sieges, each one ending in glorious defeat and jauhar, the mass self-sacrifice of its womenfolk in a sacred fire. On arrival, check-in at the hotel. And explore the Bundi. City is surrounded by the Aravalli hills on three sides and is circumscribed by a massive wall with four gateways. Interesting Monuments including impressive medieval forts, palaces, Havelis, temples with beautiful stone idols and chattris with carved pillars, along with a picturesque lake in the heart of the town, add to its charm. Bundi is very famous for its intricate carvings and murals. Overnight at hotel. In the morning drive to Ranthambore. The modern town lies about 150 Km from Bundi and was originally founded by Amer rulers (the Kachhawahas) had a long standing association with Sawai Madhopur for many centuries. The Ranthambhore fort (14km) was gifted to them by the Mughals, along with vast tracts of surrounding forest-land. The region around Sawai Madhopur is thick with remnants of its past history. Walls, wells, mosques and hunting lodges adorn the lush rolling hills of the Vindhyas and the Aravalis. On arrival check in hotel and enjoy evening park safari. Overnight at Hotel. Enjoy Morning safari to view the wildlife Afternoon drive to Jaipur Pink City, In the evening, take a walking tour of the colorful streets and bazaars of Jaipur City. The beauty of Jaipur is that its unique architecture and town planning is visible at even the most common places such as its squares and lanes. Enjoy Rajansthani dinner at Jaipur and Overnight at hotel. Morning excursion to Amber Fort with elephant ride, Amber Fort, situated just outside the city, is perhaps the most beautiful example of Rajasthani forts and gives a grand view of the city down below. Afternoon City sightseeing tour of Jaipur, Jaipur offers a plethora of touristy attractions to the traveler. The City Palace in the heart of Jaipur is known for its blend of Rajasthani and Mughal architecture. Not far away is the Central Museum with its large collection of woodwork, jewellery, costumes, brassware, and pottery. Another monument near the City Palace, Jantar Mantar, is the largest of the five observatories built by Sawai Jai Singh. The Hawa Mahal or the Palace of Winds was constructed for the royal ladies to watch the royal processions without being seen. Overnight at Hotel. On the way to Agra visit Fathepur Sikri the ghost city 195 kms from Jaipur, Fatehpur Sikri is built in red sandstone in honour of Saint Salim Chisti who foretold the birth of 3 sons to Emperor Akbar, is an example of robust stability combined with originality. Each important edifice here represents a type by itself. Notable among them is the Diwan e Khas, Punch Mahal, the Tomb of Salim Chisti, and the Buland Darwaza. On arrival check-in at hotel, later you can visit Red Fort, Etmaudullahs Tomb and overnight relax at hotel. Note : Taj Mahal is closed on every Friday. In the morning hrs drive to Delhi, 240hrs and 4hrs, on arrival, take city sight seeing tour of Delhi and, or you are free for your own activities. In time as per your international flight schedule you will be taken to International Airport for your onward flight destination.